Personalized medicine—marked at times by both excessive hype and dour skepticism—is a reality today, albeit one with a still modest reach. One of the best examples is an FDA-approved, first-of-its kind pediatric clinical trial in which children ...with a deadly, fast-growing cancer (neuroblastoma) have their tumors biopsied and characterized by modern molecular medicine tools (microarrays and next-generation sequencing). The resulting RNA profiles (gene expression) were interpreted by a predictive analysis platform that matched promising drugs to each patient’s individual tumor. 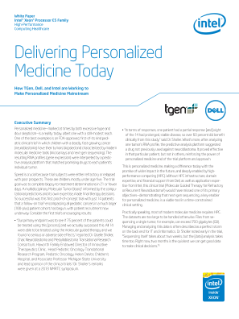 Read the full Delivering Personalized Medicine Today White Paper.